OCEANIA RESORT - Deluxe One-Bedroom Condo with Pool and Panoramic View, sleeps 4. Unquestionably the most comfortable and spacious 1-bedroom unit at Oceania, the Deluxe View One-bedroom condo surely caters to the desires for relaxation of its every guest. This unique luxury condo has a master bedroom with a most comfortable California King-size bed with Sealy Posturepedic- mattress, a walk-in closet and additional built-in closets, a romantic spa/Jacuzzi room with 2-person whirlpool tub to indulge in your every fantasy, which area flows graciously into a full modern bathroom with large glass-enclosed shower. There is further a double-size sofa-bed in the living room for your toddlers, kids or extra guests, supplemented with with two matching single lounge chairs. A 4-seat dining table and a full-sized fully equipped modern kitchen with breakfast bar ensure that you have everything at your fingertips for your creative daily meals. To compliment your needed conveniences, a semi-private washer/dryer facility (=shared with next door's Deluxe View Studio condo, locked on both sides) with storage facility is just off the corridor, that also lends access to a second full modern bathroom with glass-enclosed shower. There are two large balcony terraces (adjacent to the living room and to the master bedroom) each with unprecedented panoramic ocean views! On the balcony of the living room, there is a gas Char-Broil- Tru-Infrared- stainless steel BBQ grill so that you can prepare your exquisite dinner meats to perfection while savoring the views and/or sunset...; combined with the close-up views of the nightly color-alternating swimming pool, your paradise experience will undoubtedly be brought to overwhelming heights! The facilities include three large zero-entry swimming pools, a kiddy pool, two gyms, men's and women's saunas, a business center, two tennis courts, a kid's playroom, a game room, a squash court and a racquetball court. Wonderful landscaping on the premises. Enjoy the tranquility of the resort and stroll on the beautiful beach in front of the complex. Both bathrooms are modernly equipped with a vanity cabinets and sink, a modern toilet and glass-enclosed shower areas. Hair-dryers are provided; please bring your own other toiletries. Wonderful stay at Oceania on Aruba ! Property well-kept. Loved the pools. Management Company handled issues professionally and promptly. We loved looking out over the turquoise ocean waters from our unit’s balconies! We had great experiences exploring One Happy Island! Thank you for your lovely review of your stay with us! It is noce to read your appreciations of our prompt and professional responses, the condo and view! The property is immaculate. The staff at the facility are wonderful,the staff from Prestige are responsive for any questions or needs while you stay at their property. We stay for 4 weeks and always feel safe and secure at Oceania. The location is perfect on one happy Island !!! A great stay and vacation! This was our second time staying at the Oceania complex in Eagle Beach. The Prestige Team again went above and beyond to help provide for a vacation that was extremely relaxing and stress-free. The condo is great, very spacious, and just as described. The Oceania complex is quiet, clean, and very well maintained. Be sure to eat at the Screaming Eagle right next door and Papiamento (10 minute drive). Michelle (Prestige) reconfirmed all of our reservations and helped us to make new ones during the week. 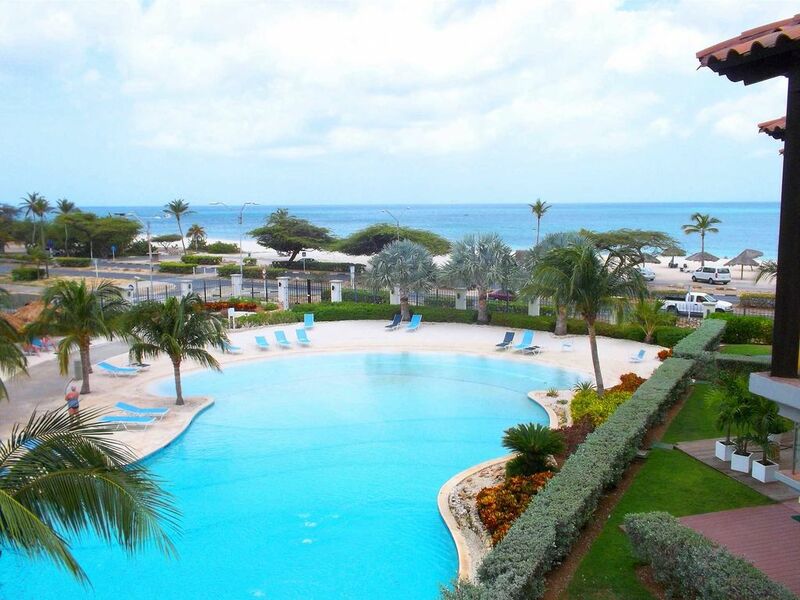 This condo and complex is highly recommended to all that visit Aruba and are interested in staying in Eagle Beach. Thanks again to the great team at Prestige!! My husband and I came for our first trip to Aruba to celebrate our twentieth wedding anniversary. We found the condo to be beautifully decorated, VERY clean, and well stocked. The best feature of the condo was the view from the deck. We spent hours on the deck overlooking the pool and the beach. There were very few people visiting Eagle Beach when we were traveling (early June) so it was wonderfully relaxing! I would highly recommend this unit to anyone traveling to Aruba. It was also very convenient to plenty of restaurants and shopping. Our first getaway trip to Aruba was most enjoyable due to the wonderful accommodations, gorgeous Eagle Beach and location in the low-rise district. Our Oceania condo was immaculate and the amenities (pools, work-out room, access to beach, high-end kitchen and bath facilities, laundry and deck with grill and unbeatable views). Staff was extremely helpful and friendly ("One Happy Island"). They arranged our airport pick-up and rental car. The nearby Super Foods grocery store had everything you would want (great cheese selection!) and the condo is walkable to several restaurants (Screaming Eagle and others). We recommend going in May when there are NO crowds and weather is spectacular (80's). The National Park and snorkeling at the northern beaches are recommended. So is just hanging out and swimming at Eagle Beach! We would stay longer next time.